Crown's first fire truck was a pumper built in 1949, which was used as a demonstrator until production was begun by a newly formed division in 1951. The firm offered only a line of Hall-Scott-powered pumpers at first, soon labelled Crown Firecoach. Their durability and huge brakes made them popular in mountainous areas. A line of larger custom equipment was added later, including ladder trucks, telescoping aerials, and combination ladder-water tower units. These came on 4x2 or 6x4 chassis, with hydraulic outriggers for stability. Fire truck production ended in 1981, except for a few cab-and-chassis units provided to another builder. About 880 Crown Firecoaches appear to have been built. The first bus with a diesel engine was built in 1954. The following year, a school bus was offered which could carry 91 students, Crown's first with tandem rear axles. Crown began producing a bus-truck hybrid the same year, which had tandem axles and an underfloor engine. It used a bus body with seating for twenty passengers, and had a twenty-foot cargo area behind, with rear loading doors. Shorter but similar units were produced with a single rear axle and provision for twelve passengers. Crown was also building highway post office trucks for use by postal contractors. Single- and tandem-axle versions, in 35- and 40-foot lengths, respectively, were built. These had the usual Crown front grafted onto a rectangular body. Another odd truck was a Crown Cargo Coach, with the bus front on a Trailmobile trailer body using a 6x4 Crown chassis. During the 1960s and 1970s Crown provided an assortment of studio, library, and medical trucks, and even heavy-duty wreckers. After the 1950 structural changes, Crown offered a variety of intercity and sightseeing coaches using modern slanted side windows. Some had a raised main deck to allow greater baggage capacity underneath. There were available in 32-, 35-, or 40-foot lengths, some with tandem rear axles, carrying from 33 to 57 passengers. Most had underfloor engines, but rear engine placement was available on the longest units. Crown's last intercity coach order was filled in 1980. Other engines offered after the introduction of diesels, besides the Hall-Scotts, were the underfloor Cummins, and Detroit inlines and Detroit V8s for some rear engine applications. Fire equipment offered Cummins, Detroit, Ford, or International engines. Once Hall-Scott had ceased production, the most common cause for the retirement of a Crown product became the lack of engine parts. Caterpillar, Cummins, or Detroit diesels were available in Crown's recent years, with additional models of each available for non-California customers. The 1989 Crown school bus lineup included 35-, 38-, and 40-foot lengths, carrying from 78 to 90 students. Axle layouts were 4x2, 6x2, 6x4, and a 40-foot bus could be built on a 4x2 chassis. Both mid-engine and rear-engine positions were available, with three-fourths of sales being the underfloor version. Manual transmissions were offered, but three-fourths of sales used Allison automatics. Leaf springs on air-ride suspension were offered. Most buses were sold with retarders to augment the braking system. Frame rails and crossmembers were built from nested channel steel, welded together. Double-walled steel bodies were welded to outriggers on the main chassis rails, a basic construction technique unaltered since 1950. Windshields were a choice of two-piece curved or four-piece flat glass. A 90-passenger 6x4 with manual transmission weighed about 25,000 pounds empty. These buses were guaranteed for twenty years or 150,000 miles, and cost from $90,000 to $135,000. Production capacity of the Chino plant was fifteen buses per week, but actual production was often less than that. This was offset by building rear-engined running chassis for a motor home builder, and a small transit bus manufacturer. Crown built a methanol-fueled demonstrator school bus which was on the road in early 1989, using a version of the Detroit 6V92, the only California-legal methanol engine. This vee-layout engine was too wide to fit in the rear position of a standard Crown 4x2 bus structure, so they designed a new, flatter rear end-cap for the body which allowed space to reposition the engine mounting. A matching front end-cap was produced, resulting in the first noticeable change to the school bus appearance in forty years. At least ten of these units were sold, and by 1990 some conventionally-powered buses used the new style as well. 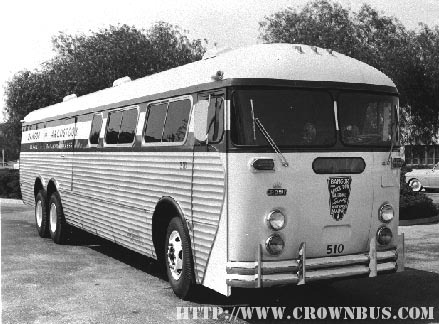 Demand was low for the durable and large Crown school buses, designed to the requirements of the western states only. Replacement needs were minimal, due to the durability of existing, older Crowns, which structurally met more recent safety requirements. Most fleets were buying the smaller, lighter, cheaper units produced elsewhere in the special "western" versions which met the local smog, noise, and lighting requirements. General Electric found the operation unprofitable, and, after unsuccessfully seeking a buyer during 1990, closed the factory doors on March 31st, 1991. On May 21st, their machinery and equipment was sold at auction. This may not have been the last gasp of the Crown Coach, for Carpenter Body Works, Inc., of Mitchell, Indiana, purchased most of the assets, including the machine tools and the Crown name. Carpenter, also a school bus manufacturer, was, according to a report in the Winter 1991-92 Bus World Magazine, intending to produce Crown's rear-engine chassis with their own bodies. Apparently, reintroduction of Crown's large integral-body school bus was under consideration, as was work on a new Supercoach, a fiberglass-fronted design on which Crown Coach was working when operations ceased.